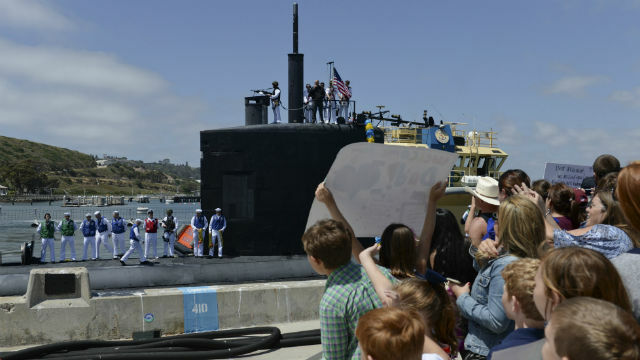 The Los Angeles-Class fast attack submarine USS Alexandria has returned to Naval Base Point Loma after a six-month deployment to the Western Pacific region. Family and friends, along with members of Submarine Squadron 11, gathered pierside Thursday with colorful banners and signs to greet the crew and welcome them home. “We operated in nearly every ocean environment across the Western Pacific, doing missions that no other platform can conduct, in areas where no other platform can operate,” said Cmdr. Todd Santala, the submarine’s commanding officer. Alexandria completed four missions deemed vital to national security and participated in five multinational exercises, spending a total of 197 days deployed and steaming more than 45,000 nautical miles, according to the Navy. The Alexandria was commissioned in 1991. Measuring more than 360 feet long and displacing more than 6,900 tons, the submarine has a crew of approximately 140.